SAN DIEGO -- There aren't many cities in California -- perhaps none -- that have an annual event that not only honors its professional stars like Bill Walton and Marcus Allen, but reaches out to high school standouts of all sports, including track and cross country. San Diego does and has since 1949 when the late Bob Breitbard started the Hall of Champions (now renamed the San Diego Sports Association). The 73rd Annual Salute to the Champions on Jan. 31 will not only induct a track-cross country icon, Meb Keflezighi, to its Breitbard Hall of Fame, but one of the four Professional Stars of the Year is former Hilltop High runner Desiree (Davila) Linden. The event, which annually draws 700 sports fans, will be held at the San Diego Marriott La Jolla and in addition to the two marathon standouts, will spotlight high school state champions like La Costa Canyon's Kristin Fahy and Coronado's Alysah Hickey (pictured at right), who earned Stars of the Month honors. Even teams are recognized as the Sage Creek girls, who captured the CIF-State Division IV cross county title in November, will be singled out for Significant Achievement. Meb, of course, is well-known as America's top distance runner and the only runner ever to win the Boston (2014) and New York (2009) Marathons in addition to capturing an Olympic silver medal for finishing second in 2004 in Athens. Those with good memories will recall Meb as a CIF-State champion in cross country as well as one of the very few to win the 1600 and 3200 in the same State track meet, which he did in 1994 while attending San Diego High. He went on to win four NCAA titles indoors and outdoors for UCLA, setting the American record at 10,000 meters (27:13.98) which lasted a decade. Coached by the legendary Bob Larsen, Meb appeared in four Olympic Games, three in the marathon, finishing fourth in 2012 and perhaps an even greater accomplishment, 33rd in the 2016 Rio Games despite stopping seven times to empty an ailing stomach. As for Linden, she won the Boston Marathon, the first American woman to do so in 33 years. She, too, was a standout runner while attending Hilltop High who then went on to star at Arizona State before jumping into the 26.2-mile event. Linden finished seventh in the 2016 Olympics after qualifying to run in 2012 but was unable to finish. Her accomplishment of winning Boston on an icy cold day in 2:39.55 got her recognition on late night television. San Diegans who were in college last year and achieved at the highest level, starting with San Diego State's Ashley Henderson, will be recognized. Henderson earned Amateur Star of the Year honors for dominating the Mountain West Conference indoors and out before finishing second in the USATF National Championships, running a 10.98 which was just behind her all-time best of 10.96. She qualified for and won the inaugural Athletic World Cup in London in 11.07, beating 2016 Olympic Games champion Elaine Thompson of Jamaica (11.09) in the finals. Former Mt. Miguel High and San Diego Section discus and shot put titlist Laulauga Tausaga, now competing for the University of Iowa, earned Star of the Month honors for placing third in the USATF Championships while ex-La Costa Canyon runner Steven Fahy (Kristin's brother) was cited for finishing third in the NCAA 3,000 meter steeplechase, running for Stanford. 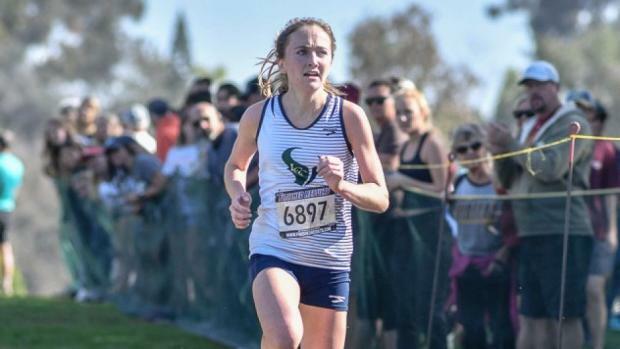 Kristin Fahy, a senior, will be in the spotlight after being selected the state's Female Runner of the Year in cross country by MileSplitCA, winning her third consecutive San Diego Section divisional title, the CIF-State Division II title, and capturing the Foot Locker West Regional championship. 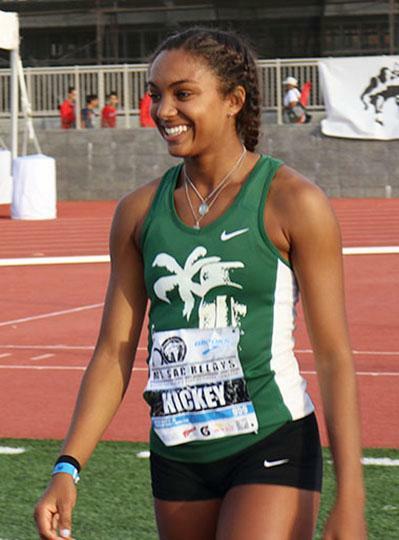 Hickey, also a senior, qualified in three events for the State Track and Field Championships, forcing her to run back and forth from the long jump to the high jump the first day. Given more time on the second day, she captured the State title in the long jump at 19-09.75 (and placed fourth in the high jump). Later in the summer she long jumped 20-02.50 at the Junior Olympics. Other high school cross country runners who earned Star of the Month honors and will be in honored include LCC's Jacob Stanford. Track athletes who will be featured are Eastlake horizontal jumper Jalyn Jackson, LCC distance runner McKenna Brown, Madison sprinter Kenan Christon and Oceanside El Camino weight event specialist Nu'u Tuilefano.